Qawwali (Nastaʿlīq: قوّالی; Punjabi: ਕਵਾਲੀ (Gurmukhi); Hindi: क़व्वाली; Bangla: কাওয়ালি) is a form of Sufi Islamic devotional music originating from South Asia, and notably popular in the Punjab and Sindh regions of Pakistan; in Hyderabad, Delhi and other parts of India, especially North India; as well as the Dhaka, Chittagong and Sylhet divisions of Bangladesh. It is part of a musical tradition that stretches back for more than 700 years. Originally performed at Sufi shrines or dargahs throughout South Asia, it gained mainstream popularity and an international audience in late 20th century. Qawwali music received international exposure through the work of the late Pakistani singers Nusrat Fateh Ali Khan, Sabri Brothers, and Aziz Mian largely due to several releases on the Real World label, followed by live appearances at WOMAD festivals. Other famous Qawwali singers include Pakistan's Fareed Ayyaz & Abu Muhammad, Rahat Fateh Ali Khan, Badar Maindad, Rizwan & Moazzam Duo, the late Amjad Sabri and Bahauddin Qutbuddin. Delhi's Sufi saint Amir Khusrow of the Chisti order of Sufis is credited with fusing the Persian, Arabic, Turkish, and Indian musical traditions in the late 13th century in India to create Qawwali as we know it today. The word Sama is often still used in Central Asia and Turkey to refer to forms very similar to Qawwali, and in India, Pakistan and Bangladesh, the formal name used for a session of Qawwali is Mehfil-e-Sama. Qaul (Arabic: قَوْل) is an "utterance (of the prophet)", Qawwāl is someone who often repeats (sings) a Qaul, Qawwāli is what a Qawwāl sings. Baul, the mystic minstrel of Bengal. The songs which constitute the qawwali repertoire are primarily in Persian, Urdu, Hindi, Bengali and Punjabi. There are some in Persian from the Mughal era, and a smattering in Saraiki and dialects of north India like Brajbhasha and Awadhi. There is also qawwali in some regional languages but the regional language tradition is relatively obscure. Also, the sound of the regional language qawwali can be totally different from that of mainstream qawwali. This is certainly true of Chhote Babu Qawwal, whose style of singing is much closer to the Bengali Baul music than to the qawwali of Nusrat Fateh Ali Khan, for example. The poetry is implicitly understood to be spiritual in its meaning, even though the lyrics can sometimes sound wildly secular, or outright hedonistic. The central themes of qawwali are love, devotion and longing (of man for the Divine). A hamd (حمد), Arabic for praise, is a song in praise of Allah. Traditionally, a qawwali performance starts with a hamd. A na`at (نعت), Arabic for description, is a song in praise of Muhammad. 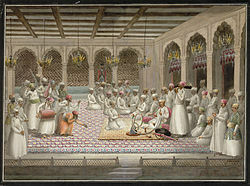 The opening hamd is traditionally followed by a naat. A manqabat (plural manaqib, مناقب, which means characteristics) is a song in praise of either Imam Ali or one of the Sufi saints. Manaqib in praise of Ali are sung at both Sunni and Shi'a gatherings. If one is sung, it will follow right after the naat. There is usually at least one manqabat in a traditional programme. A marsiya (مرثية), Arabic for lamentation for a dead person, is a lamentation over the death of much of Imam Husayn's family in the Battle of Karbala. This would typically be sung only at a Shi'a gathering. A ghazal (غزل), Arabic for love song, is a song that sounds secular on the face of it. There are two extended metaphors that run through ghazals—the joys of drinking and the agony of separation from the beloved. These songs feature exquisite poetry, and can certainly be taken at face value, and enjoyed at that level. In fact, in Pakistan and India, ghazal is also a separate, distinct musical genre in which many of the same songs are performed in a different musical style, and in a secular context. In the context of that genre, the songs are usually taken at face value, and no deeper meaning is necessarily implied. But in the context of qawwali, these songs of intoxication and yearning use secular metaphors to poignantly express the soul's longing for union with the Divine, and its joy in loving the Divine. In the songs of intoxication, "wine" represents "knowledge of the Divine", the "cup-bearer" (saaqi) is God or a spiritual guide, the "tavern" is the metaphorical place where the soul may (or may not) be fortunate enough to attain spiritual enlightenment. (The "tavern" is emphatically not a conventional house of worship. Rather, it is taken to be the spiritual context within which the soul exists.) Intoxication is attaining spiritual knowledge, or being filled with the joy of loving the Divine. In the songs of yearning, the soul, having been abandoned in this world by that cruel and cavalier lover, God, sings of the agony of separation, and the depth of its yearning for reunion. A kafi is a poem in Punjabi, Seraiki or Sindhi, which is in the unique style of poets such as Sultan Bahoo, Shah Hussain, Bulleh Shah and Sachal Sarmast. Two of the more well-known Kafis include Ni Main Jana Jogi De Naal and Mera Piya Ghar Aaya. A munajaat (مناجاة), Arabic for a conversation in the night or a form of prayer, is a song where the singer displays his thanks to Allah through a variety of linguistic techniques. It is often sung in Persian, with Mawlana Jalāl-ad-Dīn Rumi credited as its author. A group of qawwali musicians, called a party (or Humnawa in Urdu), typically consists of eight or nine men including a lead singer, one or two side singers, one or two harmoniums (which may be played by the lead singer, side singer or someone else), and percussion. If there is only one percussionist, he plays the tabla and dholak, usually the tabla with the dominant hand and the dholak with the other one (i.e. a left-handed percussionist would play the tabla with his left hand). Often there will be two percussionists, in which case one might play the tabla and the other the dholak. There is also a chorus of four or five men who repeat key verses, and who aid percussion by hand-clapping. The performers sit cross-legged on the ground in two rows — the lead singer, side singers and harmonium players in the front row, and the chorus and percussionists in the back row. Before the fairly recent introduction of the harmonium, qawwalis were usually accompanied by the sarangi. The sarangi had to be retuned between songs; the harmonium didn't, and was soon preferred. Women used to be excluded from traditional Muslim music, since they are traditionally prohibited from singing in the presence of men. These traditions have changed, however, as is evident by the popularity (and acceptance) of female singers such as Abida Parveen. However, qawwali has remained an exclusively male business. There are still no mainstream female qawwals. Although kafi singer Abida Parveen has increasingly incorporated qawwali techniques into her performances, she is still not considered a qawwali singer. Songs are usually between 15 and 30 minutes long. However, the longest commercially released qawwali runs slightly over 115 minutes (Hashr Ke Roz Yeh Poochhunga by Aziz Mian Qawwal). The qawwali maestro Nusrat Fateh Ali Khan has at least two songs that are more than 60 minutes long. They start with an instrumental prelude where the main melody is played on the harmonium, accompanied by the tabla, and which may include improvised variations of the melody. Then comes the alap, a long tonal improvised melody during which the singers intone different long notes, in the raga of the song to be played. The lead singer begins to sing some preamble verses which are typically not part of the main song, although thematically related to it. These are sung unrhythmically, improvised following the raga, and accompanied only by the harmonium. After the lead singer sings a verse, one of the side singers will repeat the verse, perhaps with his own improvisation. A few or many verses will be sung in this way, leading into the main song. As the main song begins, the tabla, dholak and clapping begin. All members join in the singing of the verses that constitute the refrain. The lyrics of the main verses are never improvised; in fact, these are often traditional songs sung by many groups, especially within the same lineage. However, the tunes are subtly improvised within the framework of the main melody. As the song proceeds, the lead singer or one of the side singers may break out into an alap. Nusrat Fateh Ali Khan also popularized the interjection of sargam singing at this point. The song usually builds in tempo and passion, with each singer trying to outdo the other in terms of vocal acrobatics. Some singers may do long periods of sargam improvisation, especially alternating improvisations with a student singer. The songs usually end suddenly. The singing style of qawwali is different from Western singing styles in many ways. For example, in words beginning with an "m", Western singers are apt to stress the vowel following the "m" rather than the "m" itself, whereas in qawwali, the "m" will usually be held, producing a muted tone. Also in qawwali, there is no distinction between what is known as the chest voice and the head voice (the different areas that sound will resonate in depending on the frequency sung). Rather, qawwals sing very loudly and forcefully, which allows them to extend their chest voice to much higher frequencies than those used in Western singing, even though this usually causes a more noisy or strained sound than would be acceptable in the West. Instrumental: This is supposed to be the announcement of the arrival of Moinuddin Chishti, as Sufi believes their saints are free of time-space. Also that Nabi, Siddiq, Shaheed, and Saleh category of faithfuls are never dead, just gone into some other state from where they visit whenever they are mentioned, especially if there is a function in their honor. Rang or Badhawa: If it is an Urs performance, then it is usually Rang, a poem by Amir Khusro. The audience is often asked to stand when the Rang is sung. If it is the Shaikh's birthday, it is usually the Badhawa. ^ Monograph Series, Issues 20-23. Center for South and Southeast Asia Studies, University of California. 1979. p. 124. Qawwali texts exist in Persian, Urdu and Hindi. ^ "Bollywood Reinvents the Qawwali – With a Vengeance". The Day After: An International Illustrated Newsmagazine of India. Retrieved 23 February 2007. ^ "Delhi's Qawwal Bachchon ka Gharana lights up Ramadan night at T2F". Daily Times: Leading News Resource of Pakistan. Retrieved 23 February 2007. ^ Abbas, Shemeem Burney (2003). Abbas, Shemeem Burney. The female voice in sufi ritual: devotional practices of Pakistan and India. University of Texas Press. BBC Radio 3 Audio (45 minutes): The Nizamuddin shrine in Delhi. Accessed 25 November 2010. BBC Radio 3 Audio (45 minutes): A mahfil Sufi gathering in Karachi. Accessed 25 November 2010.